Most days of the week I eat what is known colloquially as a "sad desk lunch." Typically it includes some turkey slices and spinach sandwiched between two pieces of bread slathered with mayonnaise. There is also usually an apple and sometimes cheese and crackers or chips. 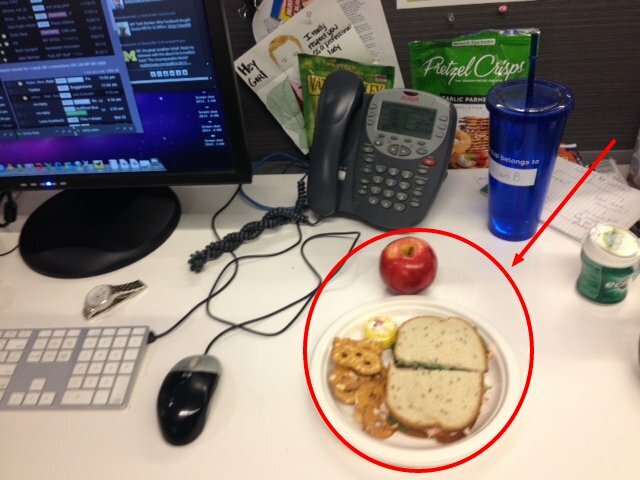 My lunch (circled in red) surrounded by all my desk items. Is your mouth watering? No. Fine. I know. My lunch is boring. It can get especially tiresome at the end of a long week when I have the same thing every day. But it fulfills my most important qualifications for a successful work lunch: It's filling and cheap. I often wonder why more office workers don't share my austere view of the midday meal, especially since most of us scarf down our lunches at our desks. The Chipotle near my office is filled with people just released from the confines of their cubicles spending $8 for a burrito like it's nothing. The same thing is happening over at 'wichcraft, a local gourmet sandwich shop where office zombies fork over $10 (on debit cards, of course) for simple sandwiches. TEN dollars for a turkey sandwich -- sure it's tasty, but c'mon! Meanwhile, I spend about $19.05 for an entire week of sandwiches and snacks. By my calculations I'm saving about $1,547.50 a year. 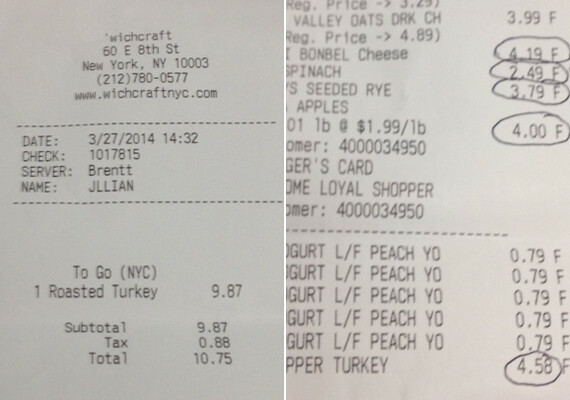 Below are two receipts: On the right is my grocery store receipt and on the left is a receipt from 'wichcraft (my editor agreed to foot the bill). I have tried to convince my colleagues to join me in bringing lunch with this simple logic: They remain unmoved. "I can't eat the same thing every day," I'm told. "Deli meat is disgusting. It's always wet. Flaccid," one said. My favorite excuse: "Going out to lunch makes me happy." Still not convinced? I enlisted the help of a behavioral economist at Cornell University, David Just, who has studied extensively why people choose to eat what they do. He explained that bringing lunch to work is the more rational choice, even if it's not the most popular one. Besides being cheaper, a homemade lunch is typically also healthier because you can better control the portions and ingredients. Packing your lunch in advance also helps workers avoid using hunger as an excuse to buy something terrible, he said. "If we're hungry, we're pressed for time and then we start responding a lot more to how the food tastes and how convenient it is and we think a lot less about how healthy it is," Just said. "We think only about the short term goals. If you're putting your lunch together in the morning, you're usually doing that right after you eat breakfast so you're not in that hot state." 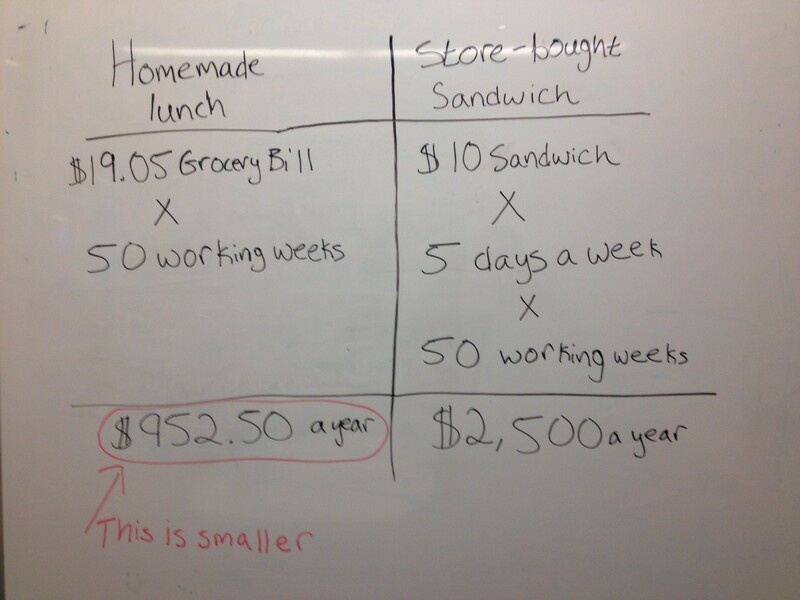 So why do most workers opt for the less logical, but more unhealthy and expensive lunch? First of all, most people like things that are easy. Packing lunches can be sort of inconvenient. I often find myself rushing around on Sunday nights to make sure I have enough time to buy my turkey, apples and bread for the week. If you're the kind of person that packs your lunch before work, you usually have to set aside a little bit more time in the morning -- cutting into much needed sleep. "You don't want to go to the hassle of putting your lunch together or you don't want to go through the hassle of having to buy things a week out," Just explained. Most workers are looking for an excuse to chat. Many people relish the opportunity to eat lunch with a co-worker; even just walking to grab lunch is an attractive social opportunity, Just said. "It can be a little off putting if one person is bagging it and another person is buying," Just said. "There's a little bit of peer pressure." I can personally attest to this; I typically agonize for 43.5 seconds every time I get a gchat that asks "wanna get lunch?" Usually I respond by pretending to think it's lame that I brought my own lunch, just so they don't feel like I don't like them. Sometimes I propose just walking with the person wherever they're going, an offer that is typically declined. Networking books like Never Eat Alone would have you believe that I'm missing out on some very important career opportunities by insisting on bringing my lunch to work. I beg to differ; I've gathered a lot more workplace gossip and advice at happy hours or run-ins in the kitchen than I ever have walking to lunch. Also, there are plenty of ways to socialize during lunch without buying it. You can eat in a public space at work or *gasp* sit outside in a park if it's nice out. And science says if I don't want to socialize during lunch that's okay too. An October study from the University of Toronto's Rotman School of Management found that having lunch with co-workers can cause more stress than eating alone if you're doing it because you feel pressured. But probably the strongest lure towards a lunch bought at a restaurant is the sense of freedom the decision gives most workers, Just said. People who buy lunch can eat whatever they want whenever they're hungry. If they're feeling Mexican that day, they can get a burrito, if they feel like they want a gut bomb, they can order a burger. In most cases though, that freedom will push you to make an unhealthy choice. "Part of the reason that trick works to eat a little healthier when you pack is that you're committing yourself to something" that you might not actually want to eat later Just said. "There's a bit of freedom with (going out). In the moment you end up skipping the apple and going with a side of fries or tater tots." You could also end up throwing away cash on lunch better spent on booze, retirement or the much more pleasant dinners out! <a href="http://www.Restaurant.com" target="_hplink">Restaurant.com</a> sells $25 gift certificates for $10 or $50 gift certificates for $20. The site also has sales throughout the year, and I've snagged $25 gift certificates for $5. I keep a stack of these things in my wallet at all times. Most places have a minimum purchase requirement (from $35 and up) but you can generally use the gift certificates any time. But <a href="http://www.moneytalksnews.com/2011/08/11/how-to-cut-your-restaurant-bill-in-half/" target="_hplink">there are drawbacks</a>: They're for dine-in only, they're nonrefundable, and they can only be redeemed once per month per restaurant. Still, the site has become so popular that you can <a href="http://www.moneytalksnews.com/2011/08/22/7-more-tips-to-save-at-restaurant-com/" target="_hplink">double dip</a> - buying Restaurant.com certificates through an airline's shopping portal in order to earn frequent flier miles, for instance.